Their first drive could be their last. 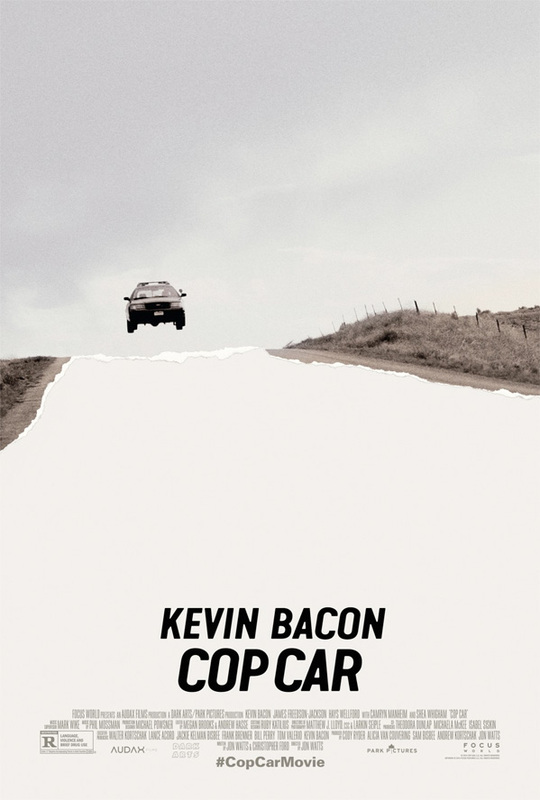 Focus World has unleashed the trailer for Cop Car, starring Kevin Bacon, a Sundance 2015 Park City at Midnight cult hit that will definitely find an audience when it hits theaters this summer. Cop Car is, as it sounds, about two kids who steal a cop car and go joyriding on rural highways. However, there's a bigger back story involving Kevin Bacon's character that makes things much more interesting. This is one of those films that is best seen without knowing anything beforehand, as the trailer shows quite a bit of footage. But if you're curious to know what the heck this is even about - fire it up. Kevin Bacon stars in director Jon Watts' delightful throwback thriller Cop Car. When two good-natured but rebellious young boys (James Freedson-Jackson and Hays Wellford) stumble across an abandoned cop car hidden in a secluded glade they decide to take it for a quick joyride. Their bad decision unleashes the ire of the county sheriff (Kevin Bacon) and leads to brutal consequences. Cop Car is directed by Jon Watts (Jewish Santa Is Coming, Our RoboCop Remake, Clown), from a screenplay co-written by Jon Watts & Christopher D. Ford. The film first premiered at the 2015 Sundance Film Festival this January in the Park City at Midnight category. Focus World will open Cop Car in select theaters August 7th + VOD on Aug 14. Sure, it does, but I don't think it really matters to this particular film. I guess if Bacon wasn't a bad cop this would be a comedy. Totally reminds me of the film Hot Shots about the two kids that steel a dealer's car, good fun so it was. Another good fun films from the 80's like Monster Squad. Who cares what the Sheriff did, kids that stupid need to die.